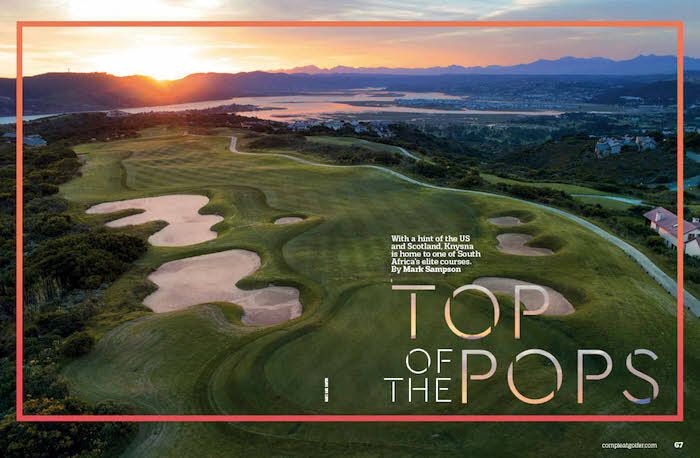 With a hint of the US and Scotland, Knysna is home to one of South Africa’s elite courses Pezula, writes MARK SAMPSON in Compleat Golfer. Pezula Golf Course has that – and so much more. Perched on the hilltops of Knysna, overlooking the Indian Ocean and Knysna Lagoon, the view alone is a great start to a memorable experience. Numerous awards over the years are testimony to its attraction. They include the Golf Digest Best New Golf Course award in 2001 and a ranking of seventh in The World’s Best Golf Resorts in 2010. In 2006 Pezula was also voted ‘Best Golf Development’ and ‘Best Sustainable Development’ by Homes Overseas magazine. Over and above the accolades, the bonus is that it is located in one of South Africa’s holiday meccas on the Garden Route. Aside from golf, the area has much to offer. Knysna is steeped in history and offers everything from hiking and fishing to restaurants and coffee shops. The area is saturated with great courses and for a golf tour, it is difficult to beat.The course opened in 2000 after US architects Ronald Fream and David Dale of Golfplan put the finishing touches to the links-style layout. It has a certain American feel to it, with ample bunkers and strongly contoured greens. The designers say the layout could best be compared to a combination of Gleneagles in the Scottish Highlands and Pebble Beach on the Monterey Peninsula. The course forms part of a large housing estate, which includes the Conrad Pezula Resort & Spa. For those wanting something a little more relaxed, on the self-catering side there are villas with between two and four bedrooms, situated a mere pitch and putt from the clubhouse and equipped with everything a golfing group or family could want. At 5 963m off the club tees, the course is a respectable length and if the wind is up it can be incredibly tough. The fairways are fair and a number of risk-and-reward short par fours allow for the better player to gain shots. One of the most attractive aspects of the course is its authenticity regarding course management and shot-making, with no blind shots or gimmicky doglegs. The two nines differ in layout and surroundings. The front nine is etched out of the higher ground of fynbos and ends with a view of Knysna Lagoon and the town below. The back nine offers massive changes in altitude as it winds down to the ocean, with the 14th having stunning views of the coastline and secluded beaches. It is the signature hole for good reason: check out the pro tip from general manager and PGA professional Francois de Lange on page 72 on how to get the most out of this short par four. Choosing notable holes on Pezula will differ between golfers. The 1st is a three-shot par five and stroke one for good reason. The drive is all about finding the fairway with a 3-wood or similar as the fairway is cut off at 235m by thick coastal bush. The 2nd is about laying up to your favourite distance to a rising fairway with bunkers right. Closer to the green a bunker short and two back left will receive any wayward approach. It’s a tough start and will certainly get the juices flowing. The 5th is a 180m par three with an Augusta feel, featuring large trees surrounding the expansive green. The length, numerous bunkers and sheer size of the green make for a difficult par. As you cross the road to the 6th, the views of Knysna and the lagoon below progressively improve until the 8th. This relatively short, straight par four of 359m drops from tee to green. The putting surface is not large but is protected by no fewer than eight bunkers and has multiple tiers to negotiate. When leaving the green be sure to enjoy the views below; at sunset it’s the best place to be on the course. The large drop from tee to green on the par-four 10th sets the tone for the back nine. The changes in elevation come into play on the 12th where the tee is perched high above the green 407m away. The hole, although straight, and with a very generous fairway, is still knee-trembling as the coastal wind often plays a part in the journey. The added time the ball spends in the air allows the wind to push it, most often from right to left. On approaching the green, which is 46m in length, bunkers front right and back left can prove treacherous and validate the 12th’s stroke-four rating. The final hole at Pezula is a tantalising carrot for the longer hitters and a test of accuracy for your average golfer. At 452m, it’s a par five reachable in two. The sliding dogleg from right to left has generous fairways protected by thick coastal bush for any wayward shots and can prove intimidating when the wind is up. The landing area is safe, but nearer to the hole two fairway bunkers await a wayward layup. The two-tiered green is huge and protected by seven deep pot bunkers. It’s a strong finishing hole which leads you back to the impressive clubhouse. The Pezula layout is enchanting, with an easy flow, a wide variety of unique holes and views around every corner. Having five tees to play from, the distance can be dramatically varied from day to day. Seldom do you find it in less than perfect condition. The final aspect that confirms its standing as one of the best is the service and attention to detail throughout, with every staff member seemingly dedicated to going the extra mile. With carts at the ready, an excellent halfway house and 19th hole overlooking the course and the ocean, it undoubtedly ticks all the boxes.